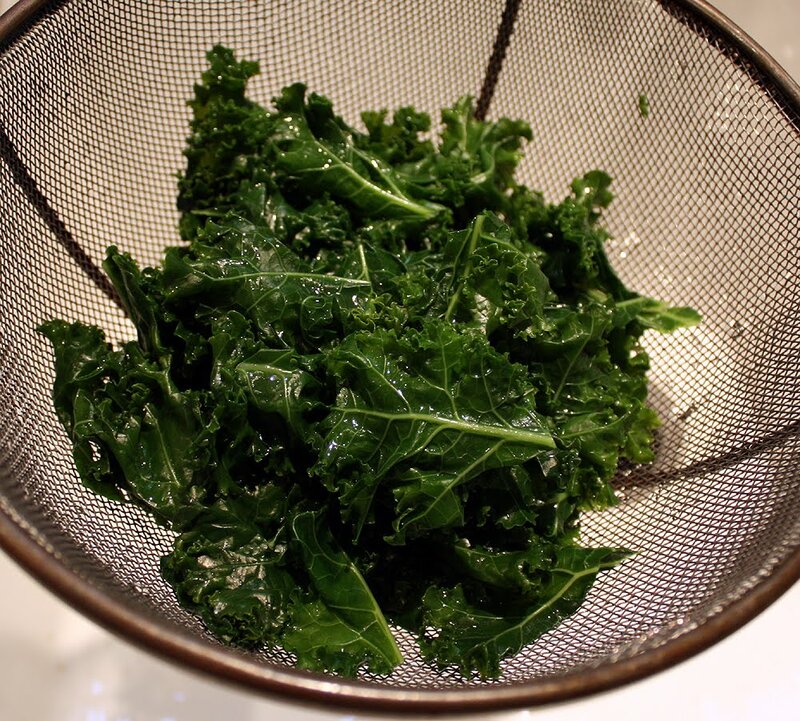 Some people like kale raw in salads or blended in a smoothie, lightly sautéed with a little olive oil, maybe steamed. I like my kale cooked - completely submerged. But I want it to retain a bright green color and still a little tooth. "Some foods suit us better if we cook them. Consider kale. It’s extremely nutritious, and you can eat it raw if you grow it yourself and pick it when it’s very young and tender, like lettuce. But, if you are buying kale at the supermarket, you had better cook it. It’s mature, which means that It’s too tough and fibrous to eat and digest raw. And even if the cooking destroys some of the vitamins, it doesn’t matter. There are so many vitamins there that you can afford to lose a few. So, don’t worry about it. You will get more good out of that vegetable if you cook it. Your bottom line (the amount you digest and absorb) will be greater, and that's what matters." Buy a bunch of kale, either the curly leaf (shown) or the darker, flatter leaf (lacinato, Russian, or dinosaur kale). Rinse it. Soak and swish it in the sink to remove soil and bugs. 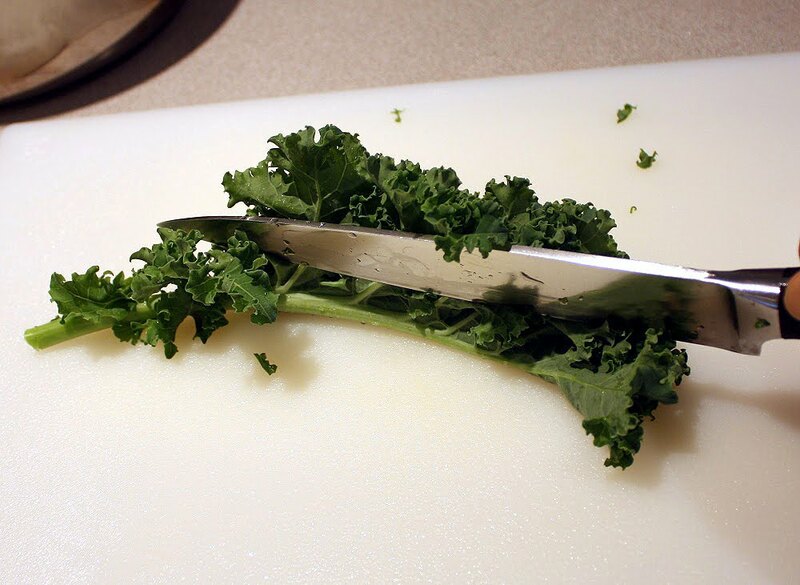 Chop kale. To remove the spine, fold the entire leaf and slice off the thick middle stem. Tear or cut the remaining leaves into about 2 inch pieces. Cook for 3 to 4 minutes, lifting lid every minute to stir and relieve pressure if needed. After 3 minutes start testing for doneness by removing a piece, letting it cool for a few seconds and gently tearing it. You can chew it too if it's cool enough. Stop cooking when it's no longer tough but still a little chewy. Strain kale as you would pasta. Rinse immediately under a stream of cold water to stop the cooking. Let drain. * The salt performs a function other than taste. It shortens cooking time. It could be boiling point elevation, or maybe it helps break down cell walls. It also helps keep the water from becoming too acidic (from the release of plant acids). Lifting the lid every minute also keeps down the build-up of acid which escapes in steam. It is acid which turns bright green chlorophyll into olive-drab chlorophyll. I usually store this in the refrigerator so it's on hand when I make soup. I add it minced to leftover rice, as a porridge. It's also very good heated with sautéed onions. Do you eat kale? How do you prepare it? One of my first jobs in high school was at Wendy's. I was the salad bar guy, and I had to "shock" the kale every day, to use it as garnish on the salad bar. I'd had to use it to cover all the ice. I was a kale artist! You couldn't see one cube of ice when I was done. At the end of the day, we threw the kale out. Who knew years later it would be a super food?! Love kale! Have a huge amount in my garden that needs harvesting & prepping to freeze. Btw, I know you don't eat pasta, Bix, but adding cooked kale and beans to whole-grain pasta makes a fabulous meal!!! Especially if you have some pesto sauce to put on it (like arugula pesto, f'rinstance--mmmm)! But you could do "aglio e olio" treatment too & it would be just as good. Arugula pesto. I may try that. Nice photos of your cooking process, btw, Bix! I cook it for about 5 minutes in veggie stock, it makes it salty but I then eat it with bland items like unseasoned potatoes or rice and mixed veggies. Oh, potatoes! I really like the potatoes-and-greens mix. Like the bitter rapini (broccoli rabe) with mashed red potatoes. That's one fine marriage. i wud do it the same way i do spinach. cook it with salt water.drain,then finely chop garlic n add that.then add single or double cream. Nice recipe, it tasted great. Thanks for the recipe. We eat kale raw, juice it, or throw in soups as a garnish but I have never cooked it. Trying to sneak more green veggies to my kids who are going through a picky phase. Made this to go in Whole Foods recipe: Potato and Kale Bubble and Squeak. I've also added your cooked kale recipe that was chopped in a food processor to mac n cheese. At first kids wouldn't eat it but I told them it was "gourmet" and they loved it. They had no idea what gourmet meant but since it didn't really alter the taste of the mac n cheese it didn't matter. So glad I found Fanatic Cook!! Just made some spagetti sauce, with very little olive oil, will serve it over fresh whole wheat linguini, with your wonderful cooked kale and some mushrooms. Thanks... oh, also a slice of mozzarella cheese, chopped over the top. Just tried kale for the first time. 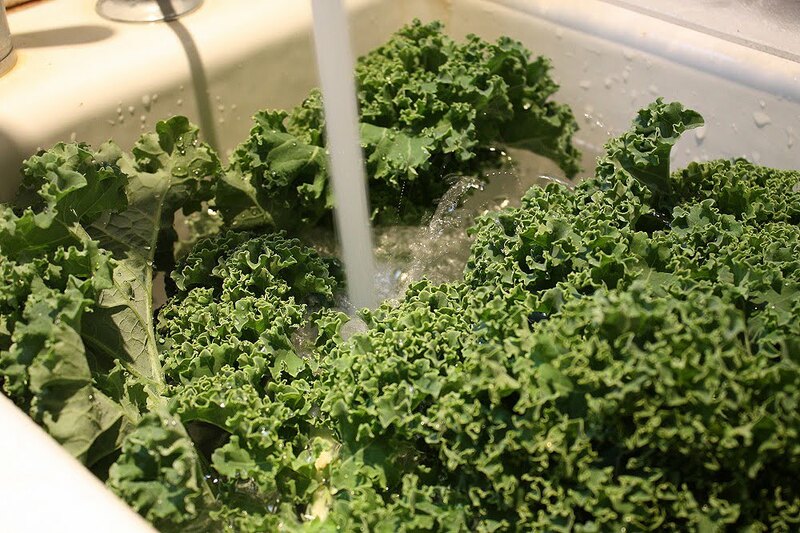 Wash and dry kale on a cloth and then put on a cookie sheet. Spray lightly with olive oil spray and sprinkle with kosher salt or whatever you have on hand. Bake in a 350 oven for 10-15 minutes until kale gets crispy. Remove from oven, cool and put on a plate. Serve as an appetizer. It is very good and healthful. It's a bit messy so is a good outdoor food. Enjoy. Seems like it makes a difference what kind of kale you use. We think the curly kind from store is more bitter than others. It also takes more cooking time. But sometimes all we can find in oklahoma! Ohhh, that's a good point. Sometimes the curly kind takes really long to cook, sometimes it just never gets soft until it turns grey. Maybe it's old? for the recipes &help with kale. Never had it before. Nutritionist says it is a good source of iron. Hopefully it"ll taste good. I have a steamer. Any recipes for steaming kale? You know, I've never steamed kale but I don't see why it wouldn't work. Would save some nutrients too! Am I the only one who eats the stems?? Into your staemer place selectetdt veggies, cover with whole-leaf kale, then cover it with cabbage leaves & steam. Opening the steamer, it then is easy to cut the cabbage/kale leaves into 2-3 smaller pieces & plating them as a base for the other veggies. Drizzle with olive oil & favorite herbs. Voila! My husband bought kale for the first time and put it on the grill. Yum! He sprayed a little olive oil on it and sprinkled some salt. Nice crunchie texture. I have an awesome micro cooker for steaming in the microwave and I just chop up kale, throw in some water, the kale, and some salt and pepper. I steam it for 7 minutes and it tastes delicious! Thanks that sounds good & is on our diet! Great ideas. My husband is on a new diet to loose weight & I'm running out of new ideas. Try adding cooked Kale to your mashed potatoes as well as green onions (shallots). Soften the shallots by adding them to the hot milk you use to mash your potatoes. Just bought Kale today and i cannot wait until tomorrow to make some ...thank you all for the stories. I just recently became a vegetarian and am so excited at all the wonderful vegatables and fruit that i am about to sink my teeth into.I just have trouble finding recipes. Thank goodness for Google. Just a word about salt in the water: it does not raise the boiling point, it lowers it, but it can probably help soften the cell walls. 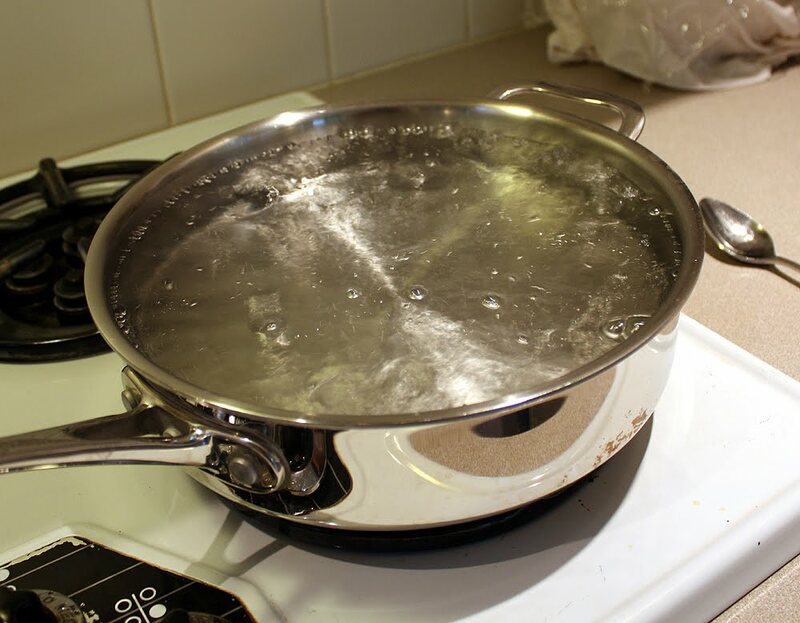 "Boiling-point elevation describes the phenomenon that the boiling point of a liquid (a solvent) will be higher when another compound is added, meaning that a solution has a higher boiling point than a pure solvent. This happens whenever a non-volatile solute, such as a salt, is added to a pure solvent, such as water." I steamed my first purchase of kale (stems and all) with sea salt and a tab or two of butter. It came out delicious! Well then they add sausages and cook it for another hour. The kale is a brown colour at the end of the process. (I wouldn’t like that personally) – a fantastic food all in all. I think its best done in a blender – combine its extracted juice with apple and carrot juice and cheers to that !! I just wanted to share the part about the freezing of the vegetable that is important. Wishing you a happy day ahead. I started buying Kale when my bearded dragon showed me he preferred it over any other greens. Since I had so much going bad before he could eat it all, I decided to try it. Had never eaten Kale before. Now I eat it daily! Thanks for the recipe tips! yummy- i have to have the yogurt though,or i don't think it's so yummy. kale smoothie yummy and good for you. blend in blender and enjoy! Gives me more go power. just tried this now. awesome recipe, really the first time trying kale in as long as i can remember. delicious! just tried this method tonight - first time eating kale in as long as i can remember, and i think i just found my new base for salads. delicious! I never knew that about the salt, the lid, and the plant acids! Thanks! I simply heat 2 tablespoons of fat (chicken, bacon, beef what ever I have on hand)in a skillet on high heat. Then I add 3 huge handfuls of cleaned kale and saute until limp. Salt generously and sprinkle with a tablespoon or two of apple cider vinegar. Yummy. I also blanch and freeze it by the pound for use in soups and veggie lasagna. takes 10 min. so delicious. Hi, I just cooked some today with some garlic, onions and lamb in a stir fry! Delicious! I just tried your method for cooking Kale, and this is my new favorite vegetable, which used to be spinach. Kale is so much cleaner and has such a great flavor. Thanks for all the recipe ideas. I just spiced up my boring chicken soup with cooked Kale and Cayenne pepper. Since I make my chicken soup in the pressure cooker, I bet adding fresh Kale along with the carrots and celery would turn out perfectly. Thank you so much for your generous instructions and to all who’ve added other great ideas that I can’t wait to try. We LOVE kale---leftovers go into omelets and soups. 1. lightly sauteed in olive oil and garlic then braised in a little chicken stock. I am putting kale in colcannon for St. Patrick's Day. Mashed potatoes, parsnips, chopped kale and butter/milk. 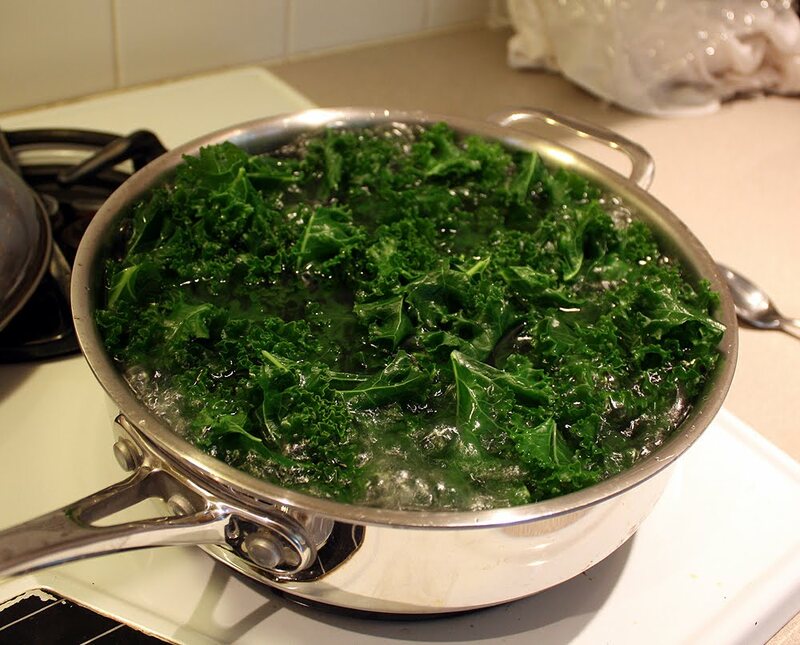 When I was a child in the 40s, my English Grandmother used to cook kale at least once a week. (Otherwise, the green was spinach) I loved both and per G'mom, drizzle a little vinegar on it and it was one of the few veggies I liked. My Personal Fitness Trainer son has me eating kale once again. I don't know why I stopped.